Get up close to Portage Glacier aboard the mv Ptarmigan. The one-hour cruise includes narration from the National Forest Service. This sightseeing tour is a perfect option for vacationers and visiting friends & family since it is only a one hour drive from Anchorage. 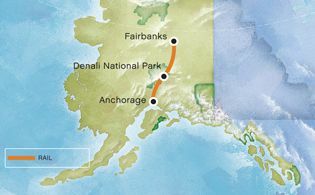 Take the Seward Highway south from Anchorage. Turn left on Portage Glacier Road (milepost 78.9) approximately 48 miles out of Anchorage. Travel 5 miles to fork in road, take the right-hand fork, travel a 1/2 mile, and turn left for the Portage Glacier Day Lodge.